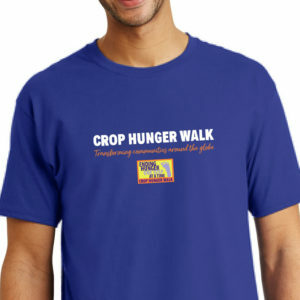 Purchase Your Crop Hunger Walk Event T-Shirts. CROP Hunger “Ending Hunger. One Step At A Time” T-shirt. This design comes on dark blue fabric. Is a unisex garment. The tees are lighter weight and more fitted. Back design can be added for $1.50 extra for each t-shirt. 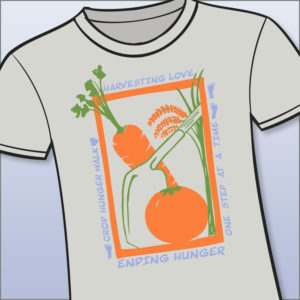 CROP Hunger “Harvesting Love, Ending Hunger” T-shirt. This design comes on heather gray fabric. Is a unisex garment. The tees are lighter weight and more fitted. 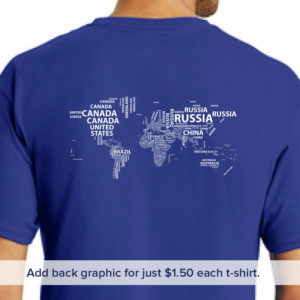 All t-shirts ship UPS Ground at a cost of $10 for the first item, and just 50¢ for each additional item. © 2019 Image Screen Printing. All Rights Reserved.